Arunachalee youth Chaphoa Wangno , belongs to Nocte tribe and resident of a remote village Rajanagar, in Changlang district successfully completed his Training of Indian Navy finally Passed Out on 22nd November 2017 as an Naval Officer. Now his identity is as Sub Lieutenant Chaphoa Wangno . During Passing Out Parade (POP) his parents and guardian Kenter Tacha were invited for the occasion at Indian Naval Academy Payyannur District Kannur, at Kerala. 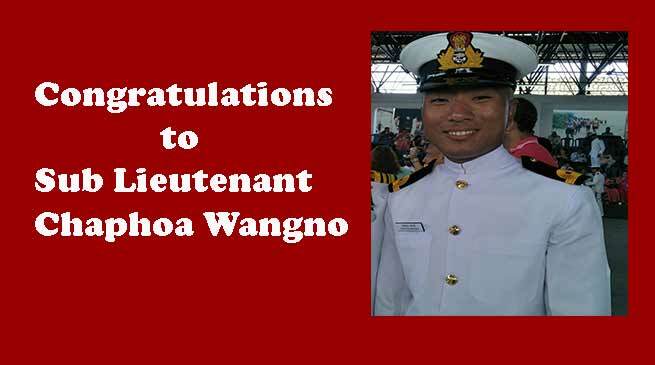 Sub Lieutenant Chaphoa Wangno is the son of Mr Chingam Wangno, Mrs Ngoanya Wangno and Brother of Mis Nyanuk Wangno. Chaphoa completed his Schooling from Jawahar Navodaya Vidyalaya Changlang and class XII from Govt Hr School Itanagar. He cleared APJEE in the year 2012 and did engineering from PSG College of Technology Coimbatore in Metallurgical Engineering. He cleared UPSC CDS for Navy and joint Indian Naval Academ in June 2017. He successfully completed his training and finally Passed Out on 22nd November 2017 as an Naval Officer.